Camden Riviere is the number one real tennis player in the world and was World Champion from 2016 to 2018. Camden has won seventeen Open singles titles, nineteen Open doubles titles, and he has been the Doubles World Champion with partner Tim Chisholm since 2015. Camden lives in Charleston, SC as a touring professional. Originally from Aiken, SC, Camden joined the Gold Leaf Pro Team in April 2015. Racquet specs: Model 355. Pineapple logo on backhand throat and "Riviere" on shaft. James Stout is the World Champion of rackets, having held that title since 2008. He is the reigning Doubles World Champion with partner Jonathan Larken. James is also world ranked in real tennis and squash doubles. In rackets, James has won twelve Open singles titles and seven Open doubles titles, and he won the US Open of real tennis in 2010. James was born in Bermuda, attended boarding school at Cheltenham College, and currently the head rackets professional at the Racquet and Tennis Club in New York City. He joined the Gold Leaf Pro Team in August 2018. Bat specs: Model 235 with the Racquet and Tennis Club logo. Chris Chapman is the third-ranked real tennis player in the world. Originally a squash player, Chris began focusing on real tennis full time in 2007 and has won two Open doubles titles along with one in singles, at the 2018 French Open. He is a senior professional at The Royal Tennis Court at Hampton Court Palace in London. Chris is from Pearcedale in Victoria, Australia, and he joined the Gold Leaf Pro Team in August 2016. Racquet specs: Model 355. Southern Cross constellation on backhand throat and "CWC" monogram on shaft. Ben Taylor-Matthews is the fourth-ranked real tennis player in the world. Originally from Dorset in the South West of England, Ben has been the head professional at the Leamington Tennis Court Club since September 2014. Ben is a perpetual contender in the professional circuit and has won two Open doubles titles, including the 2018 French Open with John Lumley. He joined the Gold Leaf Pro Team in September 2016. Racquet specs: Model 365. English Lion on backhand throat and "BTM" monogram on shaft. Steve Virgona is the fifth-ranked real tennis player in the world. Steve has been a dominant force in the game for many years having won seven Open singles titles and thirty Open doubles titles. Originally from Melbourne, Australia, Steve is currently the head tennis professional at the Racquet Club of Chicago. Steve joined the Gold Leaf Pro Team in August 2017. Racquet specs: Model 365. Racquet Club of Chicago logo on backhand throat and Steve's signature on both faces of the shaft. 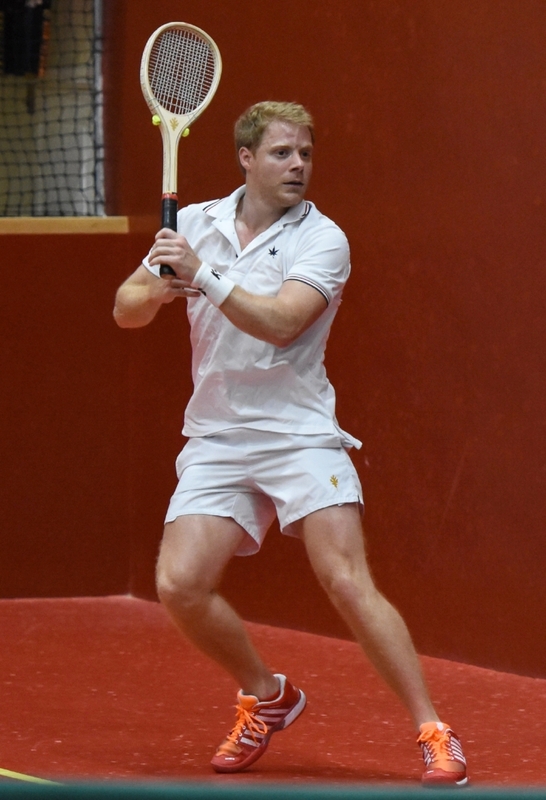 John Lumley is the eighth-ranked real tennis player in the world. Originally from Windsor, England, John is currently the real-tennis professional at the Racquet Club of Philadelphia. John has been steadily climbing the ranks of the professional game and had recent wins at the 2018 French Open Doubles and the 2018 IRTPA Championships. John joined the Gold Leaf Pro team in August 2017. Racquet specs: Model 365. "JCL" monogram on backhand throat and three "flexing bicep" emojis on shaft. Darren Long is the eleventh-ranked real tennis player in the world. Originally from the Isle of Portland, Darren is currently a professional at the Manchester Tennis and Racquet Club. Darren has won the Category A Open Championships at Oxford three years in a row and will be a contender in the game’s major championships for many years to come. He joined the Gold Leaf Pro Team in March 2018. Racquet specs: Model 365. Isle of Portland on the backhand throat and “DRL” monogram on shaft.